The water in your home or business is brought in through a large pipe, a water main, running underground to the property. While breaks can occur for a number of reasons, it is important to fix and resolve the problem immediately. When the main is knocked and broken by human error, the accident is often noticed immediately, but cracks and leaks can still develop slowly and unnoticed over time. If you step out onto your lawn one day to find it saturated with standing water, only a qualified Orlando plumber will quickly, promptly, and accurately repair and mend the situation before devastating results ensue. Although not common occurrence in the home, water mains can break for a number of reasons, often with very little warning. Orlando plumbing is subject to a multitude of conditions that stress piping even deep underground. When these leaks are slow, it can sometimes take weeks or even months to recognize the problem. You may notice a slight drop in water pressure or a leak on the sidewalk. Once identified, it is necessary to immediate contact a professional plumber in Orlando before the situation worsens. 24 Hours a day, trained professionals from A1 Service Plumbing are available to arrive quickly on the scene. A Broken water main can bring flood damage to your lawn, and your home, and can often spill into your neighbor’s property causing increasing hardship to the community. Large amounts of flooded water or even months of a slow leak will noticeably affect your water bill, accumulating costs as the problem persists. Our first priority is to find and seal off the leak immediately before further damage can occur. Once the immediate issue of water loss is at bay, our next step is to repair the water main and restore normal flow to the household. As a premier emergency plumber in Orlando, our duty is to return your life and home to normal as quickly as possible. 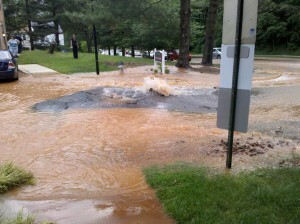 A water main break is a serious issue that can arise at any time, often when it is most inconvenient. Do not be left standing ankle deep in the consequences of aged or damaged piping, call for a prompt response and immediate visit from a well recognized Orlando plumber and get your water flowing smoothly again.